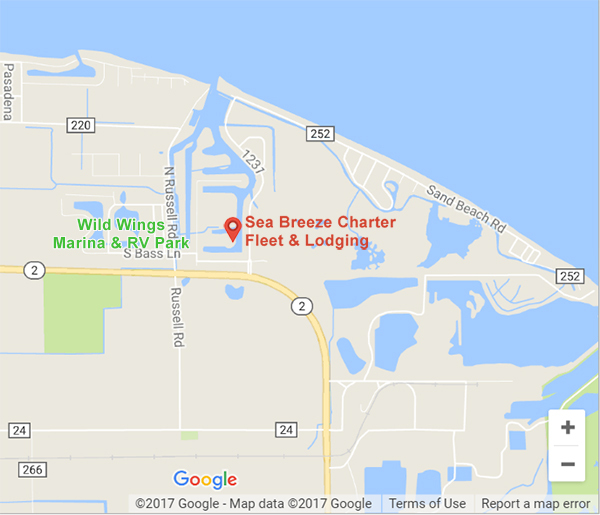 The captains at Wild Wing's Marina often boast that our location enables us to get you to the fish faster than our competitors. Take 80/90 Turnpike to exit 91. Travel St. Rt. 53 North to St. Rt. 2 go west on 2 for approximately 9.5 miles. 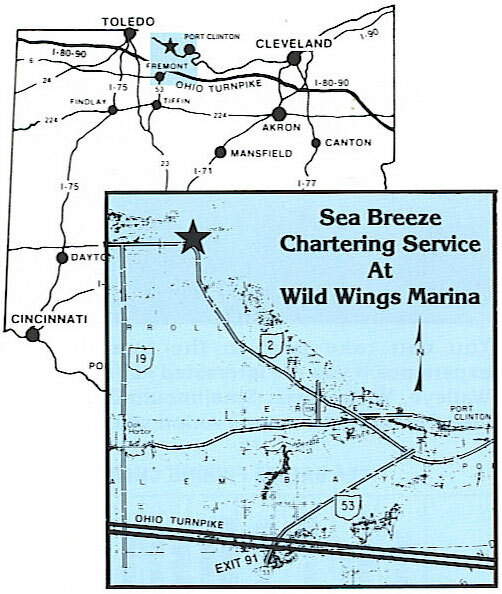 Watch for the Wild Wings Marina sign on right. Turn right on Russell Rd. (1/2 mile West of the power plant) The Marathon gas station will be on your right along with the boats. The lodging will be the first drive on your left. All lodging units are numbered. No need to check in with anyone. Your unit will be ready and unlocked (the key will be on the kitchen table) for you when you arrive. Print a copy of our site map from this page. This will make your arrival as easy as possible. If you have any questions call Capt. Bob (419) 340-0601. Take 80/90 Turnpike to Rt. 250 North. Go west on St. Rt. 2 for approximately 20 miles. Watch for Wild Wings Marina signs on right. Turn right on Russell Rd. (1/2 mile West of the power plant) The Marathon gas station will be on your right along with the boats. The lodging will be the first drive on your left. All lodging units are numbered. No need to check in with anyone. Your unit will be ready and unlocked (the key will be on the kitchen table) for you when you arrive. 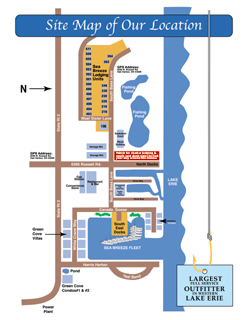 Print a copy of our site map from this page. This will make your arrival as easy as possible. If you have any questions call Capt. Bob (419) 340-0601. Take I75 North to St. Rt. 6 East (near Bowling Green, OH). Turn and go north on St. Rt. 590 till it dead-ends into St. Rt. 2. Turn right and go east on 2 for approximately 5 miles. Watch for Wild Wings Marina signs on left. Turn left on Russell Rd. (1/2 mile West of the power plant) The Marathon gas station will be on your right along with the boats. The lodging will be the first drive on your left. All lodging units are numbered. No need to check in with anyone. Your unit will be ready and unlocked (the key will be on the kitchen table) for you when you arrive. Print a copy of our site map from this page. This will make your arrival as easy as possible. If you have any questions call Capt. Bob (419) 340-0601. Please remember the dates you request can not be reserved unless a deposit of $100.00 per day has been received to hold your request. Deposits will be refunded due to poor weather conditions. Cancellation notices received 21 days prior to your actual reserved date will be applied to your next booking.